Places to Eat in Knoxville, Tennessee ↠ Potbelly Sandwich Shop. Dave and I have been big fans of Potbelly Sandwich Shop for a very long time. He used to play shows at Potbelly Shop's in Texas before we met and then he introduced me to their delicious sandwiches when we first got married and were living in Maryland. You can't find them everywhere yet, but you're lucky if they have one in your city! After Dave's show at Blue Plate Special on WDVX this past Friday, we were invited to stop into Potbelly Sandwich Shop on Gay Street downtown. We met the owner, who is so nice (you could tell the employees enjoyed working there), and learned a little more about Potbelly's history. Dave will probably be playing at this location very soon, so I'll make sure to update once we have a date set! Our Potbelly favorites: I love the Mediterranean with chicken (and without) on multigrain and Dave loves The Wreck with double meat. We both love their Broccoli Cheddar Soup and hot chips! The shakes and cookies are also delicious and this trip I shared a mixed berry smoothie with no milk with Iris (she drank most of it) and we both approved. 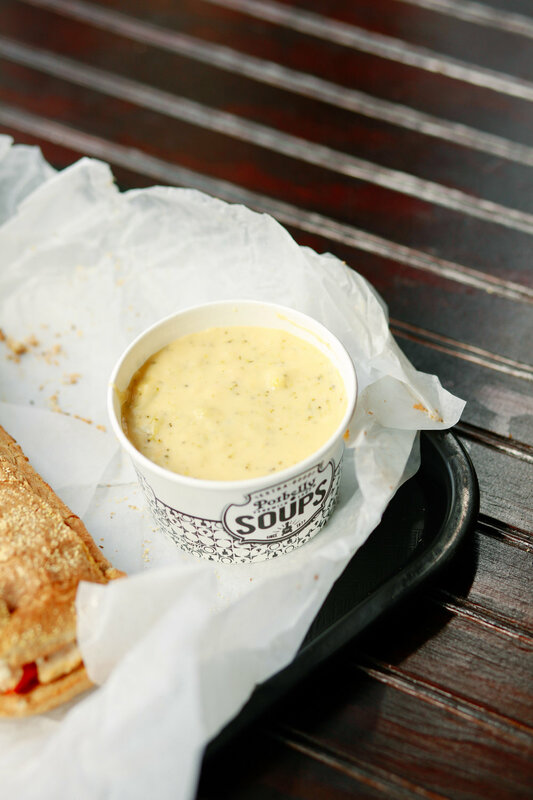 Do you have a Potbelly Sandwich Shop where you live? If so, what's your favorite thing to order? Let me know in the comments, I might have to try it next time! You can find more places to visit here.